Ram lamb #1420 arrived yesterday, along with sister, before the sun. I was up at four, loaded wood into the cook-stove and was in the truck by quarter past. Just as I was about to heave the door I heard a ewe call, I paused for a moment. I heard her again, and then a lamb. And then the ewe. And then the lamb. I started the truck and turned the head lights on, they cast light out into the pasture and between two sheds. I pulled the truck forward and to the left a bit such that light shined into the bigger shed to the south. Sure enough there were two sets of tiny eyeballs, blinking in the brightness. This particular shed is quite large and is divided in the middle by a supporting wall. As I squinted into the illuminated bays I could see that one newborn was on one side of the wall and the other was on the other side. The ewe was beside herself, running from bay-to-bay, and fretting at the calls of her babies, one always out of sight. Either she had delivered the two on opposite sides or somehow one of her little ones had wandered in the darkness. What would you have done? I was wearing my good school shoes, already behind schedule, and didn’t want to take the time to run back to the house to change into my barn boots. I kept the truck running, made my way through the barn, into the pasture, and then out to the shed. It took just a second to catch up little #1419 and to unite her with her brother. June was delighted and could now concentrate on the business at hand, and in one place. I jumped back into the truck, heaved the door, and pulled it in gear. The day was bright and sunny. 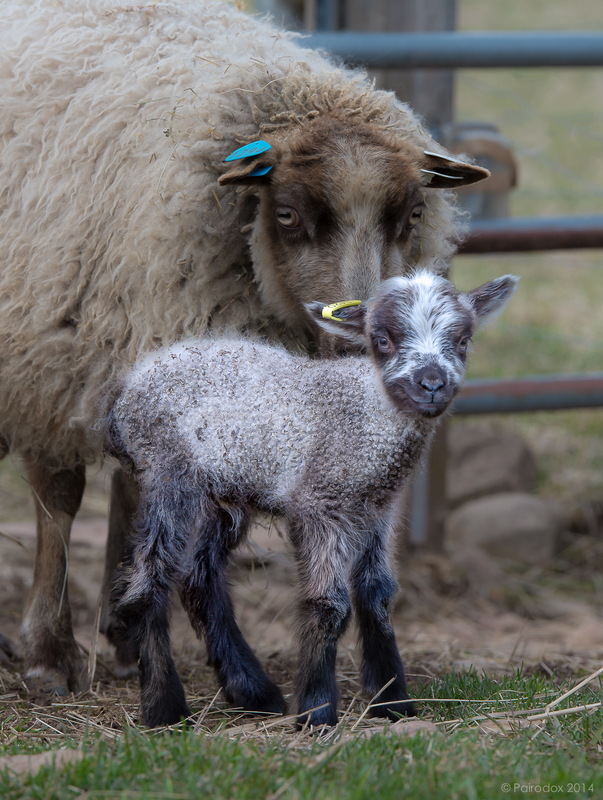 With afternoon chores behind me I took up the D600 and went out to take some lamb portraits. Here’s June and #1420, neither seemed any worse for wear for having been involved in a bit of predawn confusion.